Hip Bursitis or GTPS is a common condition seen and treated at our downtown Toronto clinic by most manual therapists including chiropractors. It is easy to diagnose when you see the right practitioner. It affects between 10-25% of population and has been recorded at rates of 20-35% in mechanical low back pain sufferers. Up to 50% of patients may experience a sharp radiating pain along the lateral thigh up to, or past the knee . Orthopaedic testing does not appear to have the ability to differentiate between gluteus medius / gluteus minimus pathology versus bursae inflammation. Why is it called GTPS and not hip bursitis? Advanced imaging studies including ultrasound and magnetic resonance imaging (MRI) have revealed that the bursal is rarely involved (more below) and that a number of anatomical structures are involved in producing the pain. It more accurately labels the syndrome and makes treatment and diagnosis more precise. Etiology – Why does my hip hurt and what is causing GTPS? 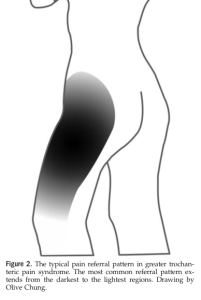 It is possible for repetitive microtrauma causing fricition or overt acute traumato the hip such as a fall to cause irritation of the trochanteric bursae and resulting pain. However studies have demonstrated that the bursae are rarely indicated as a pain generator, never mind the only one. One study implicate the trochanteric bursae in only 8% of cases of 24 cases of GPTS imaged by MRI. Tendon degeneration, tendinopathy, tears from overuse or trauma or inflammation of the hip abductor tendons (gluteus medius and minimus) may be another potent pain generator in GTPS. No abnormal findings were found in 29% US examinations. It is possible that in some cases, tendon pathology might actually proceed bursal inflammation and irritation or be the direct cause of it. Tendons heal and respond best to loading through eccentric and sometimes concentric exercises. Because this condition is unlikely a bursa issue, which would be best with rest, the tendons should be forced to work and experience the necessary load to stimulate healing and regeneration. As will achilles and elbow tendinopathies, a rehab program that includes stretching and strengthening is vital to heal the tendons and reduce the frequency of reoccurrence. As in most cases, one of the most important things to do is to determine what is the actual cause of your pain and who is best to manage your condition. In certain cases, especially with acute trauma, fracture of the femoral neck (elderly mainly) or avascular necrosis (bone death from a lack of blood supply following trauma etc) can be potential causes. Osteoarthritis, meralgia paresthetica, lumbar spine conditions, crystal deposition disorders, ITB syndrome / snapping hip syndrome, hip extensor / rotation muscle strain and infections are also potential causes of GTPS that should be ruled out by a qualified doctor, chiropractor or trusted physiotherapist. In general, it appears that conservative care including physical rehab and manual therapy techniques have better long-term outcomes than corticosteroid injections. Surgical intervention and consult should only be consulted after failed conservative therapy options owing to the seriousness of potential side-effects including serious infection. Ruta, Santiago, et al. “Ultrasound evaluation of the greater trochanter pain syndrome: bursitis or tendinopathy?.” JCR: Journal of Clinical Rheumatology21.2 (2015): 99-101. Michaud, Thomas C. Human locomotion: the conservative management of gait-related disorders. Newton Biomechanics, 2011. Del Buono, Angelo, et al. “Management of the greater trochanteric pain syndrome: a systematic review.” British medical bulletin 102.1 (2012): 115. Williams, Bryan S., and Steven P. Cohen. “Greater trochanteric pain syndrome: a review of anatomy, diagnosis and treatment.” Anesthesia & Analgesia 108.5 (2009): 1662-1670.